Hi friends! 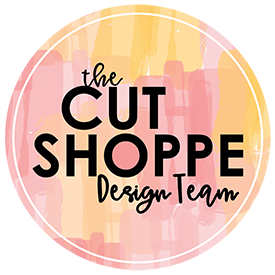 I have a new layout to share with you that was recently on The Cut Shoppe blog using the Washi Love Cut File and the Follow Your Heart Cut File. I started in Cricut Design Space by slicing apart the Washi Love Cut File. I wanted to use three of the washi images and copied/pasted the images so I had two of each design. I then brought in the Follow Your Heart Cut File and sized it over the washi stripes. My intention for the heart cut file was to use it as a template for hand stitching. Because I had 6 washi images on the layout I also wanted to have 6 rows of hand stitching, so I copied/pasted the heart cut file image a second time and sized it slightly smaller than the first. I will use the second smaller heart template to add two additional rows of hand stitching so the number of hand stitched hearts will equal the rows of washi. I cut the washi images on a patterned paper from the American Crafts Little By Little Collection designed by Shimelle. I positioned the washi in rainbow order on a white cardstock background and lightly adhered the washi strips in place. I then used my hand to hold the heart cut file image in place and used my paper piercer to poke holes along the hearts for my hand stitching. I started with the largest heart cut file image and then repeated the same steps for the smaller heart cut file image to created 6 hearts on the layout. After the hand stitching was complete, I positioned my photo on the right side of all of the hearts. I used multiple ephemera pieces from the Shimelle Little By Little Collection as layers behind my photo and also to create a cluster to the bottom right of the photo. I added one of the Little By Little wood buttons to the center of the camera die cut. I also added a Heidi Swapp mini clip to the upper right hand corner of the photo. I then moved on to the title which consists of a silver reflective word ‘Memories’ from Heidi Swapp and I paired that word with the reflective mirror word ‘Happy’ from the Pink Paislee C’est La Vie Collection. I’m getting ready to start the Ali Edwards Week In The Life™ project and as I’m prepping for this project it has me looking at my photos a little differently. I normally don’t get overly sentimental when scrapbooking older photos, but this photo really made me feel all the feelings. It was taken a few years ago on a walk home from school, but there were so many tiny details in the photo that brought back a flood of memories! That over sized Transformers book bag, the PU on Aidan’s hand for kindergarten pick up, holding hands with his cousin as we walked home. So much has changed in these few short years. Aidan has graduated from this school and the school he now attends isn’t within walking distance, his book bag no longer look like it is wearing him because he has grown so much, and at this time in his life Transformers was his absolute favorite. All of these minor details within the photo just popped out at me. I initially wasn’t going to include any journaling on this layout because I was afraid that it would take away from the aesthetics of the layout, but because I was feeling all the feelings with this layout I decided it was important. I not only included the date of the photo but also included the date of the journaling. For me personally, I know the timing of when I scrapbook a layout can determine the journaling I include. Had I scrapbooked this photo in 2014 my perspective may be different because I wouldn’t have known that Aidan’s Transformer phase would be over or that he would grow so much in just a few short years. Now you can take a look at the process video! Thank you so much for spending part of your day with me and remember to head over to The Cut Shoppe Etsy Store to check out all of the cut files and digital collections.